This is the next in the series of blog posts on research into applying ICTs to the data capture element of land registration. The previous blog post was titled: Registration of Private Land in Kenya. Following the fit-for-purpose principle, the accuracy of data capture of boundary points can be considered as a variable based on building density, topography and other requirements. In our research, we were interested to see whether affordable tools can reach the standards required by the Kenyan law for the demarcation of individual and community boundaries. There are several ways in which boundary of a parcel can be represented and demarcated. The boundary can either be a physical, man-made or natural feature, and the accuracy of it varies whether the boundary is considered as fixed or general. Fixed boundaries are high precision boundaries and used mostly in urban areas. Permanent marks (beacons) are put on the ground to demarcate land whereby their details, including coordinates, are kept at the respective survey offices and can be replaced in case they are lost or tampered with on the ground. The accuracy required for the demarcation of new boundary points for fixed boundaries is ± 4 centimeters. General boundaries are less precise boundaries defined by natural features such as rivers, streams, trees, rocks, ridges, etc. The accuracy of these boundaries is as low as ± 3 meters depending on the corridor/area. These boundaries are mainly found on agricultural lands and in rural areas. The process of land demarcation touches on either creating new grants or on the subdivision of existing grants for both fixed and general boundaries. Creation of new grants represents a transfer of rights between government lands to private lands, while the subdivision of existing grants points to divide the land into smaller pieces. National Land Commission (NLC) gives allotment letters to individuals. An individual is required to pay a certain amount for allotment to become valid. Once the amount is paid, beaconing is done by the surveyor as per required accuracies (± 4 centimeters). Computation files and survey plans are prepared and signed by a licensed surveyor and submitted to the Director of Surveys for checking and authentication. Deed plans are prepared, the new Land Record (LR) numbers are offered and submitted to the Survey of Kenya for checking and authentication. A subdivision scheme plan is prepared by the surveyor. The plan is then signed by a registered physical planner and a copy of the existing title deed is attached to it. Once the subdivision scheme plan has been approved and a copy of the title deed attached, National Environment Management Authority (NEMA) publishes a public notice to which it attaches a copy of the Part Development Plan (PDP) and sends it to the Ministry of Lands and Physical Planning. Once the subdivision scheme plan is approved, the land may be subdivided. This is granted by the respective county government. The surveyor delineates the land and puts in the beacons at boundary points (accuracy ± 4 centimeters). A computation file and a survey plan are prepared and signed by a licensed surveyor. They are then submitted to the Director of Surveys for checking, corrections, and authentication. Deed plans are prepared and the new LR numbers are offered and submitted to the Survey of Kenya for checking and authentication. A copy of the old title deed is submitted to the lands department where it is revoked and new titles are released. The government decides to adjudicate a certain area. Director of Surveys sends land adjudicators to the area for confirmation. Adjudicators collect names and other relevant information, such as an approximate area of each parcel, of the owners of these lands, etc. Adjudicators delineate the land usually using a measuring tape and a pen and paper (accuracy ± 3 meters). Title deeds are prepared and distributed to new owners. Search is facilitated at the local county survey office for the Land Reference number (LR) for the plot in question. Information on the owner of the land and the approximate area of the land in question are collected. A subdivision scheme plan is then prepared. The title deed (if applicable), LR number, information on the owner and on land, and the subdivision scheme plan are gathered and attached to the application for the consent to subdivide. The mutation form (indicating the information on land, the title deed (if applicable), and IDs of the owners) is prepared, filled, and signed. Documents are submitted to the district board for checking and authentication. The mutation form is forwarded to the land registrar for registration and titling where the old title deed is revoked and new title deeds with new LR numbers are offered. 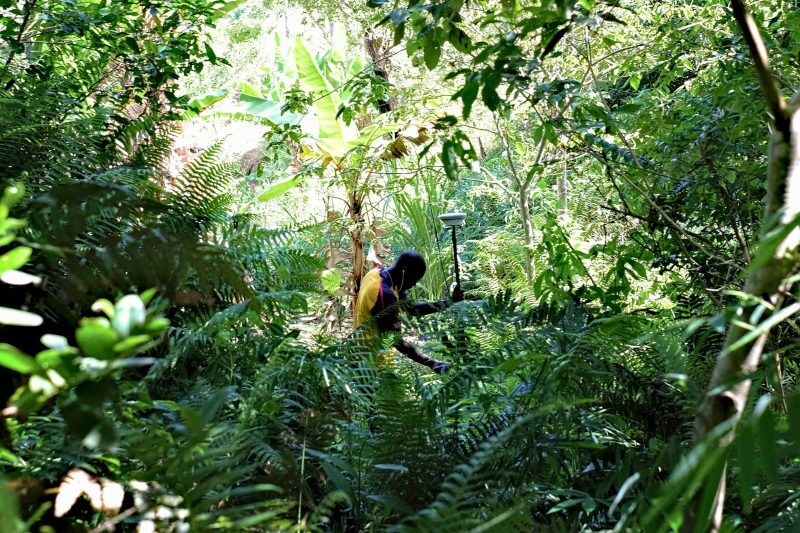 Once the consent to subdivide is granted, the surveyor goes to the ground to delineate the land (accuracy ± 3 meters), often using measuring tape and pen and paper.